Catholic blowhard Bill Donohue of the Catholic League has succeeded in his campaign to force the Smithsonian’s National Portrait Gallery – a publicly funded institution – to remove a video exhibit which he found offensive. The video formed part of an exhibition about sexual identity in American art. It was created by artist David Wojnarowicz, and featured a montage of many images. It seems that the one which gave Donohue the willies was of black ants crawling over a crucifix. This, according to Donohue, is “hate speech”. said the demented muncher of Jesus biscuits. If they’re concerned about making a statement about AIDS, they could have chosen a better way to do it instead of insult us. Because, obviously, the main concern of any artist is to carefully avoid offending the delicate sensitivities of the superstitious. UPDATE: (3 Dec) A round-the-clock protest about the Smithsonian’s craven decision is being staged by a Washington art gallery. Wojnarowicz’s video will be shown in the front window of the Transformer Gallery every day and night until it is reinstated in the National Portrait Gallery. The president and the co-founder of Transformer Gallery have written an open letter of protest to the secretary of the Smithsonian Institution. The National Coalition Against Censorship has also spoken out against the Republican Representatives who complained. Anybody is entitled to criticize an art show, but First Amendment principles bar government officials from suppressing controversial viewpoints and imposing the values held by one religious group on society at large. A Galician satirical magazine has been “kidnapped” by its printers because they disagree with it making fun of the Pope and the Church. The special issue of Retranca was meant to coincide with the Pope’s visit to Santiago de Compostela, but the printers took offence and refused to release it for distribution, citing their “moral disagreement” with its contents. The decision is absurd and has no rhyme or reason. The owner of the press told us not they wouldn’t hand over the copies because they morally disagree with the contents and they will do everything possible to prevent it seeing the light of day. Literally, they said they would not give publicity to such blasphemy. Retranca is taking legal advice. Dutch prosecutors seem to have come to their senses and decided that anti-Islam politician Geert Wilders should be found not guilty on all counts after all, in spite of the fact that it was the prosecutors who brought the charges against him in the first place. The intricacies of Dutch law are a mystery to MWW, but it seems unusual for an initially enthusiastic prosecutor to have a complete change of heart by the end of the trial, and admit that their case was essentially nonsense. Refreshing, yes. But strange. They said comments about banning the Koran can be discriminatory, but because Wilders wants to pursue a ban on democratic lines, there is no question of incitement to discrimination ‘as laid down in law’. On the comparison of the Koran with Mein Kampf, the prosecutors said the comparison was ‘crude but that did not make it punishable’. Dealing earlier on Friday with incitement to hatred, Van Roessel and Velleman said some comments could incite hatred against Muslims if taken out of context, but if the complete text is considered, it can be seen that Wilders is against the growing influence of Islam and not against Muslims per sé. On Tuesday, the prosecutors said the MP should not be found guilty of group insult. UPDATE: It gets more farcical by the day. Now the judges have been told to step down, as they displayed such obvious bias against Wilders. Denmark’s foreign minister, Lene Espersen, has denied reports in Arab media that she apologised for the reprinting of Motoons. The Egyptian Gazette had misinterpreted Espersen’s conciliatory platitudes as an apology. I can clearly deny that I have given an apology…But I can confirm that I have said that freedom of expression is not so extensive that it would not have any limits. 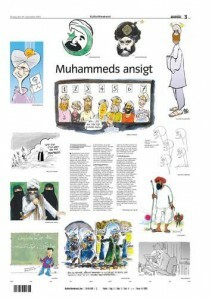 The Danish government is well aware that many people felt deeply hurt by the cartoons. I would like once again to make it clear that this is something we find regrettable, and do not wish to see repeated. I would like to make it clear that the Danish government respects Islam as one of the World’s major religions and we condemn any attempt to demonize groups of people on the basis of their religion or ethnic background. Under the Danish constitution, every citizen has the right to express himself within the limits of the law without interference from the government. Lars Vilks safely completed his lecture at Uppsala University on Wednesday. There were no disruptions, but four people were turned away at the door. The lecture was policed by around 130 police officers, and the total cost of security was an estimated 50,000 to 70,000 kroner. This time it’s in Strasbourg. A YouTube video of a man making a paper aeroplane out of a Koran page, then burning and urinating on its ashes, provoked a mosque official to inform the authorities. The man, who had given his name and location on the video, has now been questioned by police. He told me ‘We are in France and we can burn a book on Winnie the Pooh, in the same way we can burn the Koran. He was totally coherent and he didn’t seem to realise the impact of his acts. The charge that the religious authorities are filing against him: incitement of racial hatred. Correction: A commenter has kindly informed MWW that the book does indeed contain the twelve Motoons. There was conflicting information on this, and we are happy to be corrected. Jyllands-Posten editor Flemming Rose has just published a book about the Danish Motoons affair. The Tyranny of Silence does not contain reprints of the cartoons, but that hasn’t stopped the Organisation of the Islamic Conference, the Algerian Islamic Council, and Hezbollah from condemning the publishers for reprinting them anyway. The OIC’s idiot in chief Ekmeleddin Ihsanoglu expressed his “dismay and disappointment” at the release, asserting that the Danish government had a “moral responisibility” to prevent the publication. The publication of the book was a deliberate attempt to incite prejudices and animosity which would undermine the ongoing efforts of the international community for promoting understanding and peaceful coexistence among peoples of diverse religious and cultural backgrounds. The HIC vigorously denounces the reproduction in some western countries of cartoons that offend Islam and its sacred symbols. This also demonstrates their insistence on insulting the Muslims’ sanctities, presenting a cause of tension in the good relations that should exist between different religions in the world. This is what these governments should take full responsibility of. When will these clowns realise that the main thing that excites “prejudice and animosty” against Islam is the ill-informed over-reactions to non-events from organisations such as themselves. 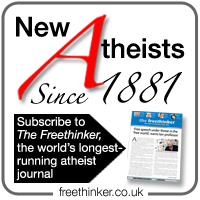 The Daily Cartoonist reports that a popular Sunday cartoon strip has been spiked by several newspapers because it mentions Muhammad. the irony of editors being afraid to run even such a tame cartoon as this that satirizes the blinding fear in media regarding anything surrounding Islam sadly speaks for itself. Indeed, the terrorists have won. I think that’s him standing behind the little girl at the ice-cream stand. Lars Vilks, the Modoggie artist whose free-speech lecture was so rudely interrupted last May, has been invited back to Uppsala university for a second attempt to complete his talk. That a university lecture is interrupted by violence is a serious thing, regardless of the opinion that provoked the reaction… It is incompatible with the basic values democracy is based on. It is to uphold these values that we are inviting him again.